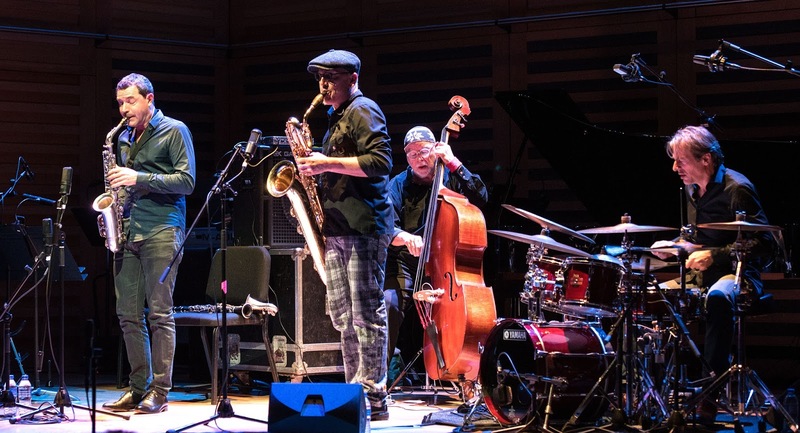 (King's Place Hall One, 17 November - 2017 EFG London Jazz Festival. Review by Patrick Hadfield). 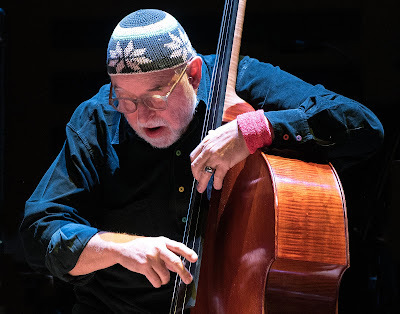 Henri Texier didn't talk much to the full house in King's Place Hall One; he let his bass speak for him. Across eighty minutes, it spoke with depth and warmth, energy and, occasionally, anger. The Hope Quartet - Texier with Francois Courneloup on baritone saxophone, Sebastien Texier on alto sax and clarinets, and Louis Moutin on drums - filled the hall with music. Individually they were superb; together, they were phenomenal. Playing material largely from the recent live release Dakota Mab, with several numbers dedicated to native American tribes, as well as older pieces such as the closing number Sacrifice - which he dedicated to this very hard working band. None worked harder than Moutin. He rarely played with sticks, instead pushing the music on with insistent brush work, or, on the several pieces, his bare hands, deftly making the drums ring. His drumming was often busy but never obtrusive. At times they were reminiscent of a chamber band such as the MJQ, as on the beautifully melodic Hopi, which featured a heartfelt baritone solo. He Was Just Shining, for Paul Motian, had a touch of Ellington: it's eastern-sounding melody and snake-like, entwining saxophone lines would have been at home in Ellington's Far East Suite. "We really didn't want to let them go." Elsewhere there were passages of free music, Texier producing flurries of notes from his bass as the alto soared and the baritone roared. There was a powerful duo between the bass and and drums, Moutin balancing Texier's tremendous bass playing with very melodic drums with just his hands. The amount of communication and understanding between all members of the band was impressive, it often being like a conversation we were privileged to be watching. On Sacrifice it was almost as if they were channelling Coltrane, the saxes playing in unison over some thunderous drumming, the whole rooted in Texier's bass playing. Together they pushed the level of intense excitement higher and higher. Coming back for an encore, they played a slower, more simple piece, the baritone and clarinet playing long notes over which Texier played a moody solo. They earned a standing ovation and huge applause from the audience: we really didn't want to let them go. Really wish I could have gone! 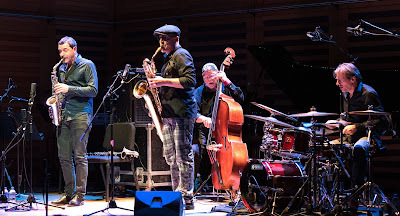 I saw Henri Texier Hope Quartet in Munich last year on the night of the EU referendum (I did a postal vote). In Germany, Texier the French bass player introduced them in English. I was at a table with German and French fans. By the end of the night the polls had closed over in England. Well whatever. I woke up to a pair of Lithuanians talking about the result, and I did another thing I never do, I drank a glass of wine at breakfast. What would you have done? I should have drunk something stronger I think. Recorded for broadcast on BBC Radio 3 on November 27.